The first thing I do when starting a new save is check out my squad. 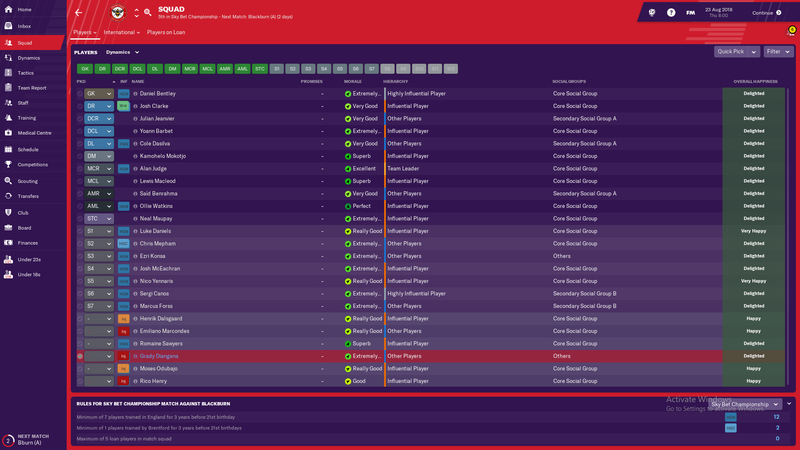 I find the best way to do this is to look at the Squad Depth under Team Report for all positions. This gives a good overview of where your teams strengths and weaknesses are, so you can choose your formation accordingly. I decided on a 4-3-3 because of the strength of my wide attacking players and because of the style of football I wanted to play. I find it’s best to tailor your style to what you have, rather than to shoehorn players into a style they aren’t comfortable with. For example, Brentford have mainly small technical players so playing Tony Pulis ball wouldn’t be the best way to go. Once you have a formation and tactical identity, the next step is fill the positions. I find it’s very useful to have a starting eleven in mind even before you begin pre-season. The next step I would take is forming that eleven. Generally, I’ll use the drop down box to choose the most suitable player for each role, checking their attributes once I’ve picked them. 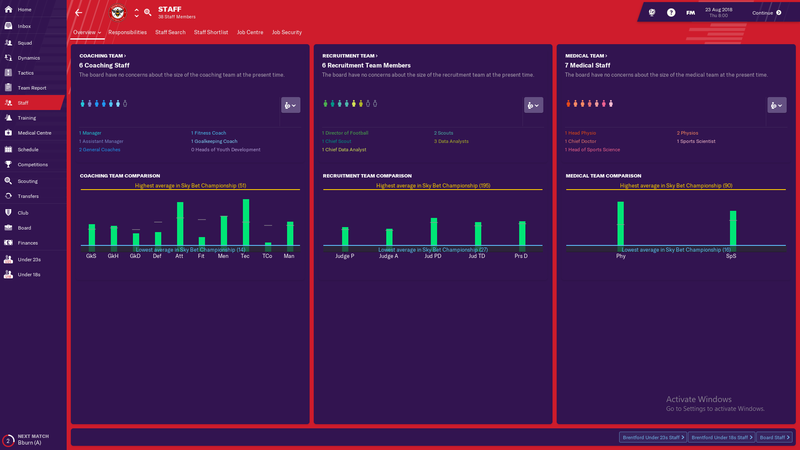 Once your squad is sorted, take a look at your Training. I tend to set up Mentoring groups myself early on, with a defensive, midfield and attacking group. I tend to take a more hands-off approach when it comes to the training schedule, setting up only the type of weekly training I want to focus on. If you prefer to be more involved, you can check out our Guide To Training here. Pre-season is the perfect time to test players in their roles to see who performs better. Keep your mind open throughout pre-season and look for players in form, it’s much better than keeping a rigid eleven in place all season. If there are any players who don’t fit your system at all, think about retraining them, or selling up. More on that later. Once you have a starting eleven figured out, the next thing to look at is your staff and training. Check out your staff screen to see how you compare to other teams in your league. If you have the budget, it’s well worth investing in your coaching staff to improve your training. I find the best way to search for staff is by looking for stats in particular areas where your coaching is lacking. Here you can see my Tactical coaching is pretty low, so a search like this would help find me a suitable addition to the coaching team. Don’t feel as if you have to replace everyone if you don’t have the budget. I often just let people’s contracts expire then replace them later on. It’s always worth signing more scouts to make finding players easier. Once you’re happy with your staff, it’s time to move onto signing players. You may find you have a gap somewhere in your squad which you need to fill. Generally. I try to have two players for every position, and sign players accordingly. That works out at 22 players, add in a spare GK and you’ve got a decent squad size. If you have too many players for one position, consider sending them out on loan or selling them. If players don’t fit your tactic, they could be another good cash injection. As for signing players, If you’re on a tight budget take a look at top division youth sides for some decent loan signings, or you can set up assignments to search for players. 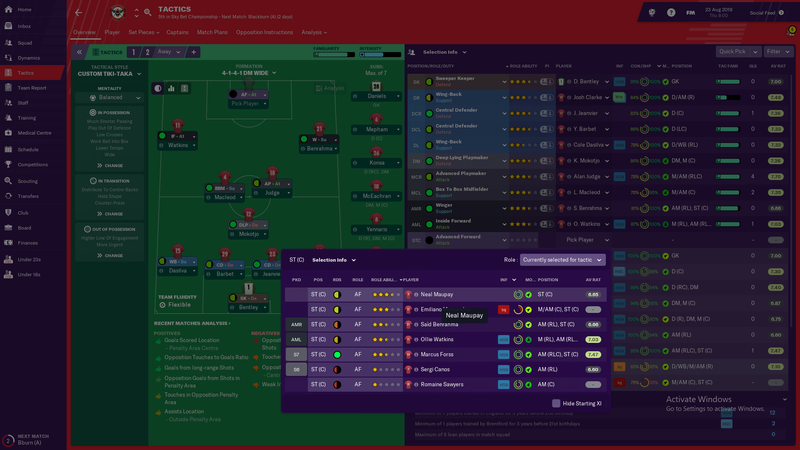 I was pretty happy with my squad, but I brought in Grady Diangana on loan from West Ham to bolster the wide positions, and a young CB for £500K from Midtjylland. When it comes to transfers, it all depends on what you want from each individual in your tactic. One thing I would say is try not to make too many signings as it might unsettle your squad. Put your new scouts to good use, by sending them out on assignments to search for specific positions or attributes. Once you’ve identified your targets and strengthened your squad, it’s on to pre-season. The biggest tip I can give for preseason is don’t play anyone too good. If you have friendlies lined up against Man City, Barca and Juve, cancel them. The main aim from your first pre-season is to get morale as high as possible in your squad. After some excellent attacking displays against weaker teams, and lots of praise from me in post match, morale was really high going into the start of our season. 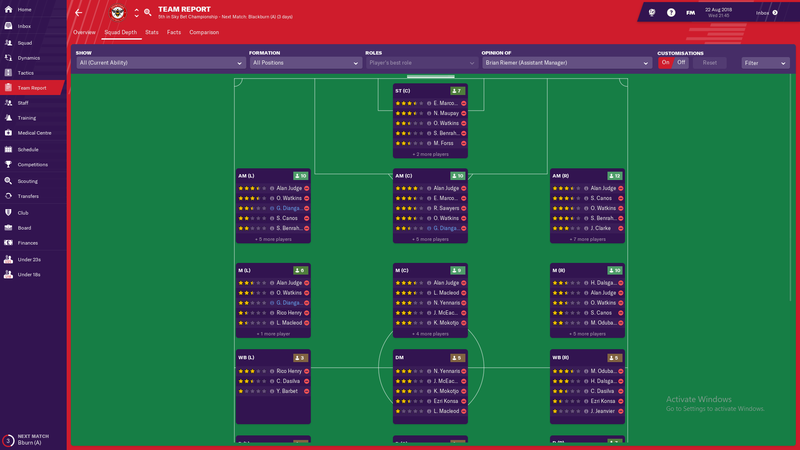 It’s also important to get some cohesion in the squad with your tactic, so it’s best to stick with the same tactic throughout your pre-season. As you can see we got off to a decent start in the league, picking up 8 points from our first four games. Follow these 5 tips with your new save and you’ll set yourself a solid foundation for a winning season. I hope you enjoyed this piece and if you’re looking for any tips on other areas of your save check out the guides below. If you have any questions leave a comment or check out our social media. That’s great to hear, thanks for your feedback and good luck with the save!